Joe Strummer, the legendary gravel-voiced punk-poet from The Clash, loved to listen to music on the radio. Even as he toured the world with "the only band that matters," he still had a dream to one day spin records for the BBC World Service, where he heard the latest UK hits over the shortwave band as a teenager in Africa. He finally got his wish in 1999, when BBC World Service premiered Joe Strummer's London Calling. Between then and 2002, Strummer hosted a series of programs with a simple format - one man and his eclectic record collection. His globe spanning playlists included many of the rock, reggae and folk artists that inspired the Clash, plus many surprises. These radio broadcasts inspired many listeners around the world, including film director Julien Temple, who prominently features these programs in his new documentary, Joe Strummer: The Future is Unwritten. "Joe was the ultimate communicator," says Temple. "He made his global audience feel they knew him on a uniquely personal level?intimate, irreverent and inspirational at the same time." 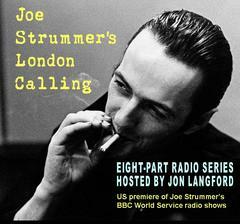 Joe Strummer's London Calling is now available for broadcast on radio stations throughout the USA as eight one-hour episodes. Distribution will begin in July 2008, timely for the US DVD of Joe Strummer: The Future is Unwritten on Sony BMG Legacy Recordings. The 14 original half-hour episodes have been edited for broadcast in the US as 8 one-hour programs. Interview clips featuring Joe Strummer, himself, his former Clash bandmates, Tom Morello (Rage Against the Machine / Audioslave), film-maker Julien Temple and others have been added to create two new 30-minute introduction and epilogue features. Jon Langford (Mekons, Waco Brothers) hosts these new segments and also introduces Joe before each of his original programs.